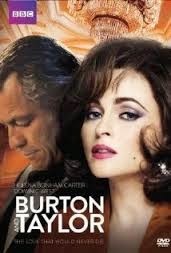 Burton and Taylor premiered on Australian television on BBC First on 3rd August 2014 and is now available in Australia from BBC /Roadshow DVD. The Elizabeth Taylor and Richard Burton romance was and still is legendary for the way in which the relationship was driven by both intense passion and furiosity. Richard Laxton's made for television biopic, Burton and Taylor covers just one small period in the saga between the two stars and as a result doesn't give a complete portrait of the infamous relationship in the usual fashion. 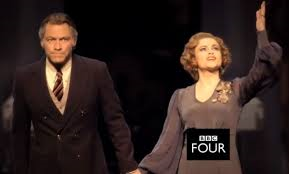 However, it does give a wonderful imprint of the undeniable chemistry between the two that was evident during and after their two marriages due to wonderful performances by both Dominic West and Helena Bonham Carter. The film is only a small snippet of a relationship that was still showing sparks after two decades, but still has quite an entertaining screenplay to keep it enjoyable and enthralling. The year is 1983 and Richard Burton (Dominic West) and Elizabeth Taylor (Helena Bonham Carter) have been divorced for over six years when they both sign on to do the Noel Coward play, "Private Lives" on Broadway. While the two have both moved on and been married and divorced once more to other people, there is no denying that there is still a strong connection between the two which provides both comfort and inner turmoil. The run of "Private Lives" becomes tumultuous behind the scenes and although Burton and Taylor try to hold it together on stage for the public, their private life is once again open for everyone to see. When making a film about real life events surrounding popular figures such as Elizabeth Taylor and Richard Burton, there is an incredible amount of pressure put on the film makers. As is demonstrated in the film, Taylor had and still has an incredibly large fan base who are exceptionally defensive of their beloved starlet. The challenge for filmmaker, Richard Laxton was always going to be how not to offend this fan base in any way and not ostracise the audience who are not watching the film for the love of Taylor. Burton and Taylor does only focus on one part of their lives, which is after their two marriages and divorces to each other. This in itself is not a cause for anyone to get upset by, but what some will find problematic is that they don't give much of a run down of the history between the two of them besides letting everyone know that they are working together again after being married twice. There is almost an assumption there that people already know who Taylor and Burton are and the basics of their history. It is a dangerous assumption to make as while this generation would know the two actors by name, they wouldn't necessarily know their history. However, the way in which the characters of Taylor and Burton interact and the chemistry between the two says more about their history as a couple than words could. The screenplay allows for the characters to tell the story of why they fell in love and why it didn't work in such an unique and admirable way. It is such an art to be able to tell a story about the past and present at the same time without telling it in the obvious fashion. Burton and Taylor may be about two superstars of their day, but it is also a study of a relationship between two people which at it's core would be the same whether they were famous or not. The way we see Burton and Taylor interact with each other tells us how and why the two fell in love with each other, which is that the two had an obvious understanding of each other and as well as being wildly attracted to each other, they also adored each other as friends. One of the things that also worked for the Burton/ Taylor marriage was that they both (particularly Taylor) strived on drama, but this was also their undoing. While it is obvious that they enjoyed the spontaneous bickering and violent outbursts, this was also their undoing. This aspect of their relationship took too much of an emotional toll on the two of them and the marriage(s) could not survive. Taylor's substance abuse and Burton's alcoholism also played a large part in this. All this is determined just from the actions of the characters and not from what the viewer is told, which is a wonderful method of both storytelling and character development. While many fans will notice there are a number of inaccuracies and some situations are enhanced for the sake of the film, the screenplay is really quite wonderful. The period in which the film is set is covered very well and the script rather witty and often hilarious, particularly the banter between the couple and Taylor's scatter-brained dialogue. Burton and Taylor is also quite nostalgic. As it is set in the early 1980's, the musical score and production and costume design all work well to flesh out the time period and give the film a playful feeling rather than it feeling like a rewatch of Who's Afraid of Virginia Woolf? Dominic West and Helena Bonham Carter are both perfectly cast as Richard Burton and Elizabeth Taylor. The first scene of Burton and Taylor where the two are participating in a press conference for "Private Lives" is not a great representation of this perfect casting, but about 15 minutes into the film you are completely convinced that you are actually watching Burton and Taylor. West completely personifies Burton with his mannerism and his stance gives him the presence Burton once commanded. His final scene in the film is so beautiful and a wonderful piece of acting. Carter is a brilliant Elizabeth Taylor. Once again, she is the perfect personification of the Taylor of the 1980's physically and in the way she spoke with her British/American accent. While many would like to see more of the infamous Burton/ Taylor fights, their confrontations are really quite entertaining and powerful. The on screen chemistry between West and Carter is fantastic. They have no problems in convincing that they are two people who have known each other for decades and are unable to stop caring for each other. Burton and Taylor is not just a film about Richard Burton and Elizabeth Taylor, it is a film about a couple who could not be without each other in their lives despite knowing they could never live with each other. A wonderful biopic which tells as much about the past as it does the present.